Came across this offer while checking out different vets in my area. £15 for booster shots is a great price as i usually pay £38 for my cat at our vets. Apologies if this has already been posted. This offer is applicable to cats and dogs only. The offer does not include vaccinations for Bordetella (Kennel Cough), Rabies or Chlamydia. The offer cannot be used in conjunction with other Vets4Pets offers. If your pet requires a primary vaccination course, each vaccination will be £15. 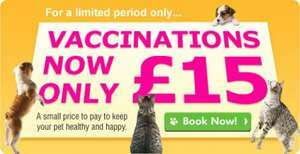 Please note that it is a condition of the £15 vaccination offer you are up to date with all payments due to us and you shall not be entitled to this offer whilst there are sums owing by you to Vets4Pets. The offer is valid until 31st August 2012. As a new customer is it £30 then or can I take my dog along for £15? I think if you are up to date with vaccines n you are just having boosters, its £15 (just take your dogs record card with you). I was looking on their website and they do a VAC4LIFE offer where you pay £99 and get yearly boosters and health checks for life, I thought it was a pretty good deal as after 3 years it will have paid for itself, and it is transferable between practices, so if you move you won't lose out. ****, just had my two cats done yesterday for £70! How annoying. Hot from me. I am not sure this one. But I think easipetcare.com is better price. If for life vaccines, much cheaper. Also check any jollyes close to you. They have teamed up with easipetcare, so will have in some stores. So I voted cold, sorry. OP. That's an excellent price. My vets started charging about £40 so I didn't get mine done when she was due her booster in January. Does anyone know if I'm ok to get her booster now or she so overdue that she'll have to start with a full vaccination first? this is just the boosters, if they are out of date and need to start again, then u have to pay full price for the first one. That's an excellent price. My vets started charging about £40 so I didn't … That's an excellent price. My vets started charging about £40 so I didn't get mine done when she was due her booster in January.Does anyone know if I'm ok to get her booster now or she so overdue that she'll have to start with a full vaccination first? may do, need to call them, mines a few year out of date, wish they did a payment plan that way i would do the vacine then pay for the boosters for life. I have a dog that I love very much. I think for this reason youm should choose the Vet by the QUALITY not the price. Also when thinks go wrong in a vet that is a business then a vets, the price can be expensive. I have a vet that is a vet, then a business! My vet has saved my previous dogs. And adviced us against treatment when the time has come to let go. When they could have made more money! Sort term this does look like a good deal. Do they have a vaccine that gets rid of fleas, stops them meowing at ridiculous-o'clock, prevents dead mice as "presents" and stops them **** in your house? Better still, one that just puts them to sleep permanently? Legally? I have a dog that I love very much. I think for this reason youm should … I have a dog that I love very much. I think for this reason youm should choose the Vet by the QUALITY not the price. Also when thinks go wrong in a vet that is a business then a vets, the price can be expensive. I have a vet that is a vet, then a business! My vet has saved my previous dogs. And adviced us against treatment when the time has come to let go. When they could have made more money!Sort term this does look like a good deal. vets for pets are a great vets, they did all they could to save my kitten and gave me a choice on what way to proceede i.e to put her down or try a specialist (i was insured ), unfortantly she was terminal, the vets sent me a beautiful bouquet after the passed away. I have been using vets4pets for years and they are fantastic. Last year my dog had a mammory mass and then ended up with pancreatitis and was very ill. They did everything they could to make sure she was comfy and got well as quickly as possible during her stay. I recommend our local vets4pets to everyone and won't use anywhere else. What's in the booster? What does it do? Surely you should have contacted police or your insurance company if fraud took place. You are required to do so by law. I have been using this company for 3 years and never had a problem. I have 3 cats and a dog and have the £99 booster for life plan for them all. I have made various claims for treatment over the past few years with no issues. As for the lump on the paw its not always that easy to diagnose things like this without some sort of biopsy or blood test. If they had told you it was a bite and it turned out to be cancer and the delay in treatment caused your pets death you would have been more distraught so is it not better to error on the side of caution rather than take a risk that could put a pet's life at risk. As for the lump on the paw its not always that easy to diagnose things like this without some sort of biopsy or blood test. If they had told you it was a bite and it turned out to be cancer and the delay in treatment caused your Perry's death you would have been more distraught so is it not better to error on the side of caution rather than take a risk that could put a pet's life at risk. I was looking on their website and they do a VAC4LIFE offer where you pay … I was looking on their website and they do a VAC4LIFE offer where you pay £99 and get yearly boosters and health checks for life, I thought it was a pretty good deal as after 3 years it will have paid for itself, and it is transferable between practices, so if you move you won't lose out. We've got the same for our kitten, he got free advocate when he had his jabs too. They were really good with him when he had an eye infection too, can't fault. I suppose it's like an franchise it depends on the branch. Nothing in Cumbria... but still HOT!!! Like most life time offers, it is only as good as the existence of the company - something that can never be guaranteed in todays environment! I live in Guildford. Nearest branch is £15 in fuel away. Suddenly the offer looks less appealing! "animal owners in receipt of a low income state benefit. " My experience of them is that they're alright but expensive. I used them via insurance to get our cat fixed up and they did a good job so I recommended them to a family member whose dog had a bad leg and needed an op. The price they were quoted was more than double that of their usual vet though. Vaccinations are cheap enough though, I'd go for the vac4life. To an extent it is a cocktail, it contains weakened or dead pathogens for a few disesases of which the most important is parvovirus. It's just like getting a vaccination from your dr and medicines are pretty much as just as tightly regulated as humans. I would definitely recommend a vaccination course as a puppy at the very least. Also for anyone wondering, you will be requested to do a full course (i.e. 2 shots 3 weeks apart for £15 each so £30 total) if you're pet's vaccinations are not up to date otherwise the booster by itself will not be effective and a waste of time and money. A primary vaccination course is simply two boosters/shots of vaccine and I would encourage everyone to do this one thing at least for your new pet. Also neutering! they may have special vaccine for this type of offer ie just water in the syringe!! Thanks for the advice all. Dont know if they still do it but our dog has 'pay up front for life' … Dont know if they still do it but our dog has 'pay up front for life' wich was around £80 10 years ago, this includes a annual booster and checkup, if you think your pet will last over 10 then quids in! this was also from v4pthey may have special vaccine for this type of offer ie just water in the syringe!! It's £99 now but if you have someone refer you its £94. Pretty sure it's legitimate as you get the batch stickers from the injection and our local cattery have accepted it. There's also a voucher for a Free Dental check on there website. If he has never had jabs then he will need a full course (£15) then 3 weeks later another jab (£15) = £30.